@HiddenLegend shared some food pairing ideas If you can source it locally, roast dragon is amazing with the Kings Mead. @ermd had a blind taste test for their Lab Rat Report. Bottom line if you want a great desert mead for the price, this is it. @drjh found this surprisingly enjoyable to drink. It definitely is a sweet wine but not cloyingly so and the sweetness came across as being very natural and was very easy to drink just by itself. @OrigGadgetLady shared some Lab Rat Report findings. As I sipped, the mead was sweet on the tongue, and somewhat cloying and thick as it reached my throat. Our award winning contemporary meads have hit the “Not-too-Sweet spot between meads and wines. We’ve created complex flavors that delight connoisseurswhile offering wine lovers a change from the same old grapes, and delighting beer drinkers with a complexity of flavors that aren’t overpowered by sweetness. Our Traditional line of honey mead wines are crafted in the style of the old world. Enjoyed by mead enthusiasts everywhere, these meads are designed for those wanting traditional mead with big honey flavor. They have been described, as a great representative of what mead should be and with over 12 flavors ranging from traditional honey to chokecherry you’re guaranteed to find an option perfect for even the pickiest palate. Also known as honey wine, Mead really has been around for millennia. And mead makers, sometimes called mazers, have spent most of that time honing their craft. It could be argued that the wine makers are the copy cats. Mead has a vast history from many lands and civilizations since the honey bee can be found in China, Africa, Europe, or North America. Because honey was a universal source of sugar for a long time, mead honey wine was almost everywhere. It takes sugar to make alcohol, whether it is grapes, sugarcane, grain sugar or honey. Honey was the dominant sugar of the world until not that long ago. Various events brought an end to universal bee keeping in Europe, and eventually, a shortage of mead. Incidentally, this seems to have happened right about the time North America was being colonized, which left the New World without honey wine. Eventually, grapes and sugar cane made honey wine scarce all together and the world largely forgot about mead, at least for a little while. Despite honey wine’s scarcity, the legacy of the nectar of the God’s has lived on in western civilization. The root word for medicine was mead. Hippocrates used fermented honey and elderberry mixtures as cures or medicines. Our Western tradition of taking a honeymoon comes from the medieval European tradition of giving newlyweds a month’s (moons) worth of honey wine. It was believed that honey wine elixir would raise the chances of this couple producing male offspring. Mead is Non-Vintage, but ages well if desired. The King’s Mead is a traditional style mead that is made in the style of the old world. It has a very smooth sweet honey flavor. You can enjoy this delightful mead on its own or with dessert. If you are looking for a traditional style, sweet, honey mead then this is the one for you! If you want mead that is less sweet, try our award winning Pure Honey Mead. Known in Greek Mythology as “nectar of the gods,” mead became the exclusive drink of royalty. Our King’s Mead wine captures all the qualities that inspired centuries of poetry, legend, and song. Hidden Legend Pure Honey Mead is a tastefully contemporary version of man’s oldest mead wine. Crafted in the style of a semi-dry table wine, it captures the flavor of honey without being too sweet. Enjoy it by itself or as a complement to dishes like grilled fish, roast pork, and spicy Asian or Mexican. Made exclusively from pure Montana honey. This honey mead is best served at room temperature or slightly chilled. Our Pure Honey Mead is our #1 selling honey mead and like all of our honey wines, it is all natural and has no add sulfites. Only the finest pure honey was used to craft this mead wine. Hidden Legend Meadery’s Pure Honey Mead is a perfect balance of honey flavor, acidy, and a little bit of oak. This complex honey mead is made using age old wine making techniques substituting honey for grapes to make honey wine. The wildflower honey used to produce this mead wine is a distinct Montana wildflower honey that creates layers of flavor that lend themselves perfectly for food paring. That is what makes this mead wine a contemporary version of man’s oldest drink. These flavors are preserved in this raw honey by the careful care that is taken in handling this all natural honey. It has never been cooked and the cold fermentation process preserves the flavors of this delicate wildflower honey. This mead honey wine is finished ensuring the perfect honey flavor without being overly sweet. This honey mead will delight wine and mead wine drinkers alike. The legend begins in Mentor Ohio when a boy is fascinated watching his uncle, a research chemist, transform juice into wine. The fascination becomes passion when he does his eighth grade science project on fermentation. Ken Schultz is on his way to becoming a winemaker! In 1975 he began making wine as a hobby, using the native varieties of grapes from the Great Lakes region where he lived. In 1979, Ken and his wife Lisa moved to Montana, where they lived in a tipi while they worked on their home. The lack of modern convenience did not deter Ken from his hobby and he continued to make wine and store it in the wine cellar beneath the tipi! The lack of local, available grapes in western Montana however was discouraging. In 1989, a neighbor gave Ken a 5 gallon bucket of crystallized honey and he decided to try his hand at making mead, the most ancient of all fermented beverages. The day after bottling the mead, Ken and his family moved to Papua New Guinea to develop a village level vocational training program. Arriving back in the USA, a long 7 years later, they all celebrated by trying the mead and it was heralded by all as Wonderful! Hidden Legend Winery is proof that man’s desire for great wine can happen even in the most challenging natural environments! The natural bounty from the wilderness of the western Rocky Mountains can be transformed into award winning , world class wines that capture the special nature of Montana. Does mead keep like port? After I open a bottle, how long will it keep for? @Twich22 I asked my coworker who brews his own. He said no more than 2 years. @Twich22 misread the question. When opened, google says with in 24 hours. However in my most recent conversation about mead, coworker has had a jug that has been open for a year that he sips. I’m pretty sure the brandy he added alongside with honey helps his meads longevity. Can’t say the mead here will hold up the same. @Twich22 we have aged ours and found that 5 years is a good age. I have a bottle in my collect that is 16 years old. There is a meadery in Poland that has a 25yo mead. @HiddenLegend @Twich22 As a general rule, when you’re under about 18% ABV, you’ve got a day to MAYBE a week if you keep an open bottle in the fridge. Once you hit that magic point where nothing can live in the booze (i.e. fortified beverages), shelf-life-when-open extends tremendously. Treat this like a bottle of wine. @corrado That makes sense. Thanks! I have a coworker willing to split this. He’s leaning more towards the red label as he said it’s more sweeter like a desert wine. The yellow label he mentioned was more dry like a Chardonnay. If Viking Blod mead shows up somehow, well we are talking 2 cases now. Bummed I’m not a labrat on this one. My good friend owns Georgia’s first meadery. @jhkey I’ve had their stuff at local festivals. It’s quite good. Maybe they’ll get in here on day. Who has ever spelled it tipi? Correct according to Websters but that’s a first for me. I received a notification that I’ll be a lab rat for this, but the bottle won’t arrive until later this afternoon. My wife was just asking about dinner tonight, and I’d like to eat something that goes well with the wine. Chinese is out, had that yesterday, so perhaps Indian? Are there any other questions that I should try to address in my report, which I hope to post tomorrow am? @roncunningham A curry would be great with the Pure Honey Mead. If you can source it locally, roast dragon is amazing with the Kings Mead. @HiddenLegend Who in the world would dream of serving non-locally sourced dragon? I’ve drank mead, often very cough young mead, and SCA events with all sorts of food, from roast beast, to duck, to pies, etc. It’s all in the expectation. Most yanks don’t like sweet wine with food, although they like soda, so go figure. Don’t have any preconceived notions and you’ll be fine. I received an e-mail on Thursday indicating I’d been selected to be a lab rat due to my support of the Kickstarter campaign. I checked the tracking number and saw the wine would arrive at my office on Friday afternoon. As I mentioned above, I wanted to pair food with this, so we picked up orders of Himalayan lamb curry, palak paneer, aloo bhanta, desi chow mein, rice and naan for the family. I immediately put an ice wrap on the bottle so that we could taste this as it chilled. Starting at room temperature, the mead struck me as not dry yet not sweet. It tasted like wine but without any of the fruit notes. Just like the nose, the taste was faintly of honey. It was a fantastic pairing with the spicy Indian food. It stood up well to the strong flavors, wasn’t overpowering or overpowered - just a nice somewhat neutral taste after each bite of food. The second glass had some chill and the flavor and nose became more pronounced. More honey with sweet notes but not cloying in the way a dessert wine would be. Kind of like an off dry riesling without any of the grape if that makes any sense. Chilled, the mead was even better with the food. The flavor was more assertive and added a pleasant, slightly sweet compliment to the food. I should say now that I’m not a fan of white dessert wines. I like Port, but I don’t care for anything sticky sweet. I would buy this to have an alternative to beer when eating spicy foods. As well as this paired with the Indian, I would expect it to pair equally well with say Mexican or Thai food. I have a glass or so left and plan to try this on its own later tonight and will post any notable follow up thoughts. Thanks Casemates for the opportunity! Kudos for @winedavid49 getting some meadery participation here. Hope s/he revisits before the offer is up. In for a case, could have some to share. In for 6. Maybe this will motivate me to make another batch of Black Current/Blueberry Melomel with Buckwheat Honey. What a dirty, sneaky trick, mentioning you are from Mentor in your post. Now I have no choice but to order a case. We overlapped at MHS: I was in the class of ‘67. I grew up in the neighborhood across Mentor Avenue/SR20 from MHS and MES. Are you a bucks football fan as well, or do you only follow ancient sports such as jousting and soccer? @jeffreywsnyder We sponsor our local Highland Games so now the caber toss is our sport! Happy that it ships to Oh but sad that 2 day shipping is no longer available as I need this for a viking themed party Oct. 06 in Eastlake right next to Mentor, Oh. Est delivery shows oct. 15 delivery at earliest. @chipgreen It will definitely ship before Oct.
@chipgreen i agree it should get there in time, but it should be noted that it is not guaranteed. This is our first foray with Hidden Legend and we always add some cushion time on transit expectations to be safe. OK guys, I took a chance but only went for the 6’er since no guarantees. Anything you can do to expedite it to me in Macedonia, OH in some way, shape or form would be highly appreciated! Hoping it’s already on its way? Have not received tracking info. Looks like I will be an empty handed viking this weekend. Glad I only went in for 6. I suspect you’ll have a fine time nonetheless. Thanks for chiming in Hidden Legend folks. we enjoyed setting this up. fyi, they have very cool drinking vessels on their website. I’ve never had Mead. As such, not sure I would take a flyer on a six pack, but what would I expect? Honey flavors but without the sweetness? Honey seems to convey terrior well, so would I get a sense of the flowers the bees found? @radiolysis my palate isn’t super good but you can definitely get a sense of the kind of honey that went into the mead (e.g. wildflower honey). As to sweetness, you’re going to get a drier, white-wine-like experience from the Pure Honey Mead while the King’s Mead is considerably sweeter (like a dessert wine, almost). I’ve had both (and several other of their meads) and I’d definitely recommend picking up the sixer, especially if you’ve never had it before. I think this meadery is a great introduction to mead. So I live just north of @HiddenLegend. If I order a case, can I just pick it up in person? @magnuspraeda Unfortunately we can’t do local pick-ups for this offer. Thanks for asking though, and please do stop by next time you get a chance! @HiddenLegend Rats! I’m still getting a case since it’s a great deal. Isn’t the picture they’re using one of the character portraits from Baldur’s Gate? @winer , Golden Axe actually. Nice spot though! A monkey in blue attire dropped off a bottle of kings mead today. Chilled it down, now time for a little sip or two. To start off with there were 3 of us trying this. My son, who is a chem eng makes his own mead trying various honeys and flavors. He knows which yeast to use to get the so called desired end product. As such, we tried, blinded, against his desert mead. We couldn’t chose which we liked more. Then I showed him the price, he couldn’t believe we could get it for this price. He expected between $20-30 and even at that he would buy if he didn’t have 12 cases made of various meads/ cysers. Received The King’s Mead as a lab rat and tried it today. It tastes of……well….honey! I found this surprisingly enjoyable to drink. It definitely is a sweet wine but not cloyingly so and the sweetness came across as being very natural and was very easy to drink just by itself. It would pair very nicely with a dessert such as cheesecake or fruit tart. When I received this I thought that this was going to be a few sips and done. I’m working on my second glass and we’ll be finishing the bottle tonight. If you enjoy the taste of honey and are looking for a nicely balanced sweet/dessert wine then I’d strongly encourage you to give it a try! I received a bottle of the Pure Honey Mead this evening as a lab rat. Today’s lab rat sample brought back the golden memory of my first mead experience at the Turf Tavern in Oxford, England as a jet-lagged 22-year-old. From what I can remember, it was pretty good stuff, tapped from a barrel. The rest of the evening is something of a blur: the mead went down very easily, the night was dark, and I was in a strange country. I do know that I found my lodgings in college after some meandering. Oh, and I had a bit of a headache the next day. Having been a lab rat in days of yore, I know my duty. After picking up the shipment at the FedEx counter, I rushed home and opened the bottle. The label advised food pairings, but I was not prepared to rustle up roast meat, fish, or spicy Asian food. I did have the makings of nachos, and plenty of pickled jalapeños, so that became the meal plan. The label advised drinking the mead at room temp or slightly chilled. I’d had a busy day and wanted to sip something before cooking, so I poured, then dutifully swirled and sniffed. The single note I detected was vegetable, perhaps hay or dried grass. As I sipped, the mead was sweet on the tongue, and somewhat cloying and thick as it reached my throat. I felt the alcohol enter my system through osmosis, which made it easier to take another sip. When my glass was empty, I stashed the bottle in the freezer to chill while I threw together the nachos. My husband took a sip of his glass and left the rest. I am not a picky drinker, and colder was better. I drank another two glasses with the nachos, and I’m finishing my husband’s glass while I write this lab rat report. I’m glad to know that the remaining half bottle should keep for a while. I’ve put in a good stopper and stored it in the fridge. As soon as I finish the inch or so of mead left in the glass, there is a good pour of pinot grigio waiting to clear my palate before I brush my teeth and hit the sack. Any questions or comments? I’d be glad to interact. I’ve not tried this particular meadery, so I can’t compare, but I’d give it a try. Well, I am giving it a try, bought a case. @Cerridwyn Yeah. I found Chaucer too dry/bitter for my tastes. Hence the asking. Like, the friend I have making mead makes things with local/sustainable honey. 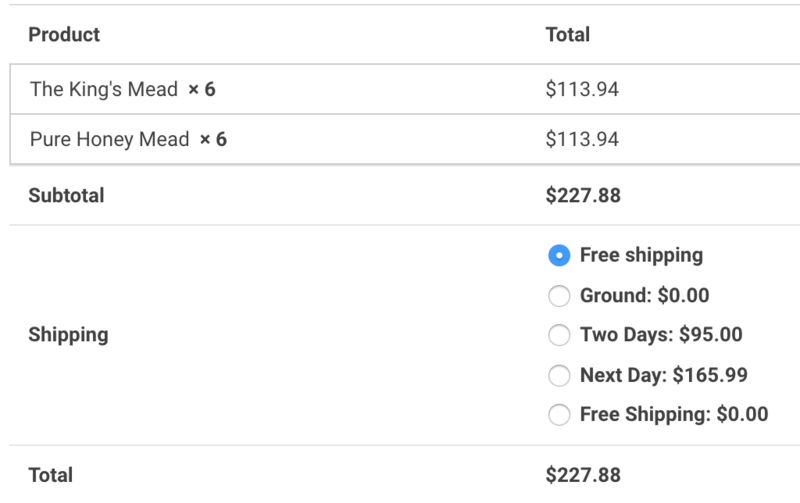 I’ve never had mead so I’m excited about this! My order number seems very fitting. I used to be an adventurer like you, then I took a Casemates charge to my credit card, hurr hurr! @dbarrym And a matching horn… Sandor Clegane, here I come! Saw the alert on meh, and couldn’t help myself. THIS is the sale where I wish you shipped to Canada, eh? I love mead sOOOOooooOOOOooooo much! Well–it seems I’m a first time lab rat! Can’t wait to hear your opinion! I was finally able to open my Pure Honey Mead a couple of hours ago after letting it come down to room temperature as it was a bit warm when I picked it up at FedEx here in Florida. On PNP it was still a bit warm after 20 minutes in the fridge, so back in it went. Now about an hour later it has a bit of a chill to it. The color is a lovely golden-yellow hue. This is a bit dryer than other Meads I have tried and not nearly as sweet. The alcohol hits you a bit more as well. Overall I like it quite a bit. The flavor of the honey comes thru-but it’s so delicate. I swear I taste honey suckle! I’m going to put it back in the fridge before we go to dinner for my son’s birthday tonight (German food) and I plan on taking it with us to see how it pairs with food. Thanks for the opportunity to be a Lab Rat! Why is this not shippable to MA? @SaintO In order for us(Hidden Legend) to ship to a state we must have the License required for Direct Wine Shipping. We do not currently have MA, but it is on our list to acquire in the future. Finally! Meeeeeeeeaaaaaaad! Tonight we drink for our ancestors! Hey! Just wanted to chime in to say that I have had a fair amount of this mead (including several varieties not included in this offering.) I have a friend who is a big fan, and purchases by the case. He is a bit of a mead connoisseur – drinks it both in the states and when he’s travelling in Europe. He considers this one of the best shippable meads available in the states. Yes, it’s definitely better than Chaucer’s. I particularly like the “King’s Mead” variety. I am interested in hearing what the rest of you thought of this! I was already a fan, as I mentioned earlier. Anyone else had trouble getting the plastic seal off the top? I had a bottle that must have been triple dipped. If you have a suggestion, let me know. You can usually just plunge the corkscrew in and power through the wax although I have not yet opened any of these. @Cerridwyn I just used a corkscrew and went through everything. Worked ok. Seems like there could be a better sealing solution though.